Are you tired of being too hot in some areas and too cold in others? It’s called EWC Zone Control. A home with no HVAC zoning will leave someone uncomfortable somewhere in your home. It’s too much to expect one thermostat to provide perfect conditions for every room in your home. What is comfortable for the sleeping area may be uncomfortable for the living area and vice versa. A home without HVAC zoning is uncomfortable and costs you more in heating/cooling costs. Why should you sacrifice comfort, spend more money and waste more energy? You no longer have to! Zoning your HVAC system is the answer. 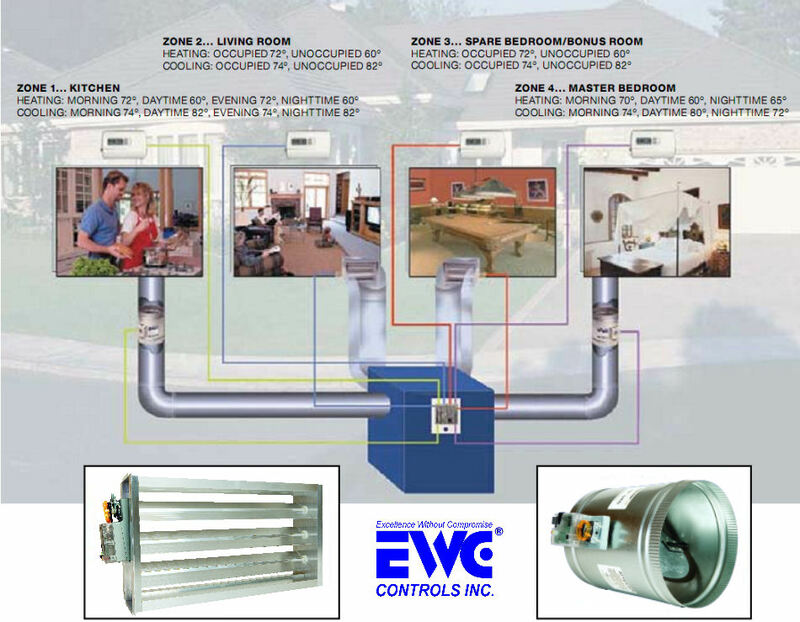 An EWC ULTRA-ZONE HOME requires no special attention on your part, simply set the temperature in each zone to your desired comfort level and your ULTRA-ZONE zone system does the rest. HVAC Zoning divides your home into areas with common heating and cooling requirements. Each zone is controlled by its own thermostat, allowing you to be comfortable no matter where you are in your home. HVAC Zoning also allows you to leave unoccupied areas without heating or cooling, saving you more money on energy costs. In addition, EWC’s ULTRA-ZONE system can be used with a variety of night setback thermostats. An Ultra-Zone control system is probably the most cost effective improvement you can make to your home. Typically, a homeowner can expect to save hundreds of dollars a year in energy costs while at the same time improving the quality of life in the home. Ultra-Zone is the leader in the HVAC industry. You can expect the motors that drive our zone dampers to last virtually forever. Our state-of-the-art, computerized central HVAC zone controllers are the most reliable in the industry and trouble free. An Ultra-Zone control system is compatible with all thermostats and HVAC equipment. Our zone control systems are also easy to install or retrofit into an existing structure so installation costs are minimized. So unless you’re frozen to your chair or fainting from heat stroke, call your local contractor today and get zoned… Ultra-Zoned. The Ultra-Zone zone control systems provide personalized comfort of heating and air conditioning equipment for homes and offices. The Ultra-Zone system uses motorized dampers controlled by room thermostats to selectively control the temperature for each zone of the home or building. This is called “zoning”. Areas are zoned off in order to allow tighter control of heating and cooling. This is very similar to the lighting and plumbing systems in a house. You do not have one main light switch that turns ‘on’ and ‘off’ all the lights in the house, nor do you have one faucet that turns ‘on’ and ‘off’ all of the water in the house. Each system has separate controls for each room and fixture. The Ultra-Zone system will allow that same degree of control for your HVAC system’s heating and cooling capabilities. No more running ‘up’ and ‘down’ stairs to control the temperature. Each zone has it’s own thermostat. Ultra-Zone systems can reduce your HVAC’s energy costs by 25-30% or more. By using setback thermostats, you only pay for the heating and cooling when you want it. The HVAC equipment in your home makes up the largest part of the monthly utility bill. Why not control these items the same way you do with your lighting and plumbing? Why use an ULTRA-ZONE system rather than two HVAC units? Some contractors are installing two HVAC units to try and satisfy the comfort needs of homeowners. This is an expensive alternative to an Ultra-Zone system. Two HVAC units cost more to install and maintain. One unit and a damper system is far less expensive than the cost of the second furnace. The cost of two units drastically increases when an additional air conditioner is installed. For example, in place of using two 2 ton HVAC systems, an Ultra-Zone system can be used with one 4 ton unit to an average savings of 30-35% of the overall cost. This cost reduction comes from eliminating duplicate work and installations. With one unit, the installation is much faster and the material will cost less. With lower costs to the homeowner and more comfort features as its benefit, the Ultra-Zone system is highly recommended over installing two units. The purpose of the Ultra-Zone system is to provide total comfort in the home and office. Motorized dampers are “opened” or “closed” by thermostats based on the temperature set point of the homeowner. The damper system will control the airflow through the HVAC’s ductwork and deliver ONLY the desired air to the desired location. Each thermostat has the ability to turn on and shut off the HVAC system. The Ultra-Zone system can accommodate over 30 zones. This means that over 30 thermostats can be installed in a home or building to control the temperature in each zone. With one thermostat the entire house is one zone, making it difficult to control the comfort level throughout the house. With multiple thermostats (zoning), occupants can maintain their desired temperature set point upstairs and downstairs independently of each other. There are very few Ultra-Zone components that are needed to make the HVAC zoning system function. The zone control panel is the “brain” of the system. The zone thermostats allow independent temperature control and the zone dampers control the airflow to the zone thermostats. A transformer is needed to power the zone control system and occasionally a by-pass damper may be required. Along with some thermostat wire, these are the only components that are needed to install an Ultra-Zone system. The above diagram shows a typical installation with all of the components needed for a zoning system. > Most homes need a minimum of two zones, the living areas and the sleeping areas. > Additional zones for the kitchen, family room, and entertainment areas will add additional comfort and energy savings. > Two story homes- downstairs and upstairs (heat rises so upstairs is usually hotter). > Any room that is a “part time” room such as basement, utility room, guest room, etc. > Individual bedrooms where family members require different comfort levels (such as baby’s room or grandma’s room). Zoning your home is actually quite simple and makes perfect sense. In a home that is not zoned, one thermostat is installed on the middle level and this one thermostat turns on your HVAC system for the entire home based on the temperature of the middle level alone. In a home with an Ultra-Zone system, a thermostat is installed on each level of the home. If any one of these thermostats calls for heating or cooling, the Ultra-Zone system opens a damper for that particular level and directs all of the heated or cooled air to that level alone. Thermostats which control the air flow to each level of your home gives you real comfort throughout your entire home. Ultra-Zone eliminates the problem of cold basements and over heated upper levels.